Here’s our recommendations on where to eat & play, shop & stay and SPECIAL OFFERS for Christmas Lights Cruise guests. To redeem the special offers present you booking confirmation or boarding pass (ticket) to the participating businesses. All offers are valid 1st December 2018 to 6th January 2019 (some date exclusions may apply). Overlooking the Indian Ocean, Seashells Mandurah offers 4.5 star absolute beachfront accommodation, with 1, 2 and 3 bedroom self contained apartments and luxurious villas. Book your stay direct with Seashells Mandurah and save 10% on the Daily Rate, PLUS receive a bottle of wine on arrival. Terms & Conditions: To book call 9550 3000, email mandurah@seashells.com.au or book online using the code ‘XMASLIGHTS’. Valid on stays 30 November 2018 – 6 January 2019, excluding Christmas Day and Boxing Day. Located in the heart of Mandurah – between the Ocean Marina and town centre – the Mandurah Ocean Marina Chalets are 5 mins to everything including our departure jetty! They are the perfect family friendly accommodation option, where kids can ride their bikes and scooters in the safely walled complex. Book your stay direct with Mandurah Ocean Marina Chalets and save 10% on the Daily Rate. Australia’s favourite dessert destination! Their delicious chocolate inspired menu includes churros, desserts & cakes, premium shakes, hot chocolate, coffee, truffles, Macarons and more. Open every day until 10:30pm, don’t miss out on their special offer for our cruise guests: Buy 1 get 1 free churros! They will also have a special Christmas menu. The best ice cream in the world can be found right here in Mandurah at Simmo’s Ice Creamery. Their Christmas pudding and white Christmas flavours will be returning for the festive season alongside 39 other flavours to choose from every day. Open until 9pm, they also do great milkshakes, sundaes, banana splits, hot waffles, coffee & cake. WA’s favourite Asian cuisine family restaurant – Hans Cafe – is located at our departure jetty in Mandjar Bay. They are renowned for their delicious variety of dishes including, noodle and rice dishes, meat and vegetarian dishes. The best value feed in town, they will be open until late every night and offering a 10% discount for our cruise guests. Capturing the feeling of theatre with a theatrical aspect to their dishes. The all new Stage Door Waterfront Restaurant use locally sourced, seasonal produce with a focus on small plates and sharing food, bringing people together. They are located at our departure jetty and offering our guests 1 x Complimentary glass of house red or white wine OR a complimentary standard coffee with any MAIN meal purchased. Terms & Conditions: Offer only applies to main meals off the A La Carte Menu. Set Menu/Specials not included. 1 x free drink per person per ticket. Overlooking the stunning Mandjar Bay, ‘The Pen’ as it’s known locally, features the biggest and best beer garden in town, a modern Australian menu at its bistro style restaurant, live music (on selected days), a 7 screen spots bar and a huge range of beers on tap, extensive wine list and unique cocktails. Present your booking confirmation to receive buy 1 get 1 free glass of bubbles! Overlooking the stunning Mandurah Ocean Marina at Dolphin Quay, Catch 22 Tapas & Cocktail Lounge offers a unique dining experience, featuring an extensive range of delicious tapas and the BEST cocktails in town. They will be offering an all you can eat tapas with a beer/wine/cocktail and little sweet, every night for ONLY $55pp. The heritage listed “Tuckey House” lends itself to the creation of a wonderful small bar with integrity and a whimsical sense of humour. Bar Therapy specialises in gourmet bar snacks and cocktails you wouldn’t dream of. Happy Hour at this favourite bar – 5pm to 6pm weekdays – includes beer, wine & cocktail specials, PLUS 1/2 price bar menu! The Redmanna Waterfront Restaurant is WA’s Seafood Restaurant of the year 2017 and Mandurah’s most awarded restaurant. Enjoy the freshest local produce, cooked to perfection while you sit back, relax and take in the incredible, uninterupted views of Mandjar Bay, through their floor to ceiling glass windows. Mandurah’s newest family friendly venue – The Bridge Garden Bar – offers a great range of food choices from sliders, to wood fire pizza’s to hand crumbed Parmis. They have a wide selection of tap beer, boutique wine & hand crafted cocktails, with live music on Friday & Sunday’s. Open until late every night cruise guests receive 15% OFF! Located on the Mandurah Foreshore, Flics Kitchen is a purveyor of pushing the boundaries using unusual ingredients and bringing excitement to the Mandurah restaurant scene. Serving an innovative breakfast menu, and a lunch & dinner menu that is designed to be shared, be prepared to be excited by what your about to eat! It’s all about fresh food fast at the Hummingbird Café Waterside Café! They are a warm, family friendly café with food and drink options to make everyone happy and specialising in vegan, vegetarian and gluten free. Open every day from 7am to 5pm, they are offering our cruise guests quiche & two salads for only $12. A unique Christmas wonderland located at Dolphin Quay. Tis the season Christmas shop stock everything Christmas from baubles to 7ft Christmas trees, life sized reindeers to Christmas miniature villages. Open all year round and during December until 9pm every night, they are offering our cruise guests 10% OFF storewide. One of the most historic amusement sites in Australia, King Carnival Mandurah has loads of amusement rides, 18 hole mini golf course, arcade lane and a kiosk with delicious goodies. There’s something for the whole everyone to enjoy. They will be open every day until late with a special offer for our cruise guests: Buy 1 get 1 free mini golf! Ride the ‘Big Toot’, the only licensed for the road trackless train in Australia and see the best of Mandurah. It stops at 10 designated Stations around the City (from the Eastern Foreshore to the Mandurah Ocean Marina) and you can hop on and off all day. They are offering cruise guests 50% OFF – Adults ONLY $10 and kids are FREE! Open Every Day From 1st Dec. Located on the Western Foreshore, Just4Fun Aqua Park is a completely floating playground suitable for all ages! Climb, slide, jump and splash on the catapult, climbing wall, giant slide, Saturn, Moonwalk, trampoline, see-saws, slides & new obstacles. With a sandy beach, swimming area, shady trees & BBQ facilities, it’s the ideal place to spend a summers day. 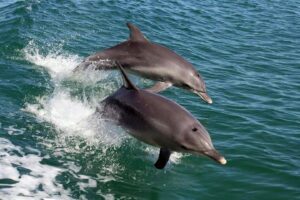 Explore Mandurah’s calm, inland waterways and encounter playful, wild dolphins, view wetlands teeming with diverse birdlife, cruise through the backyard of Mandurah luxury canal homes with live commentary. You can even enjoy a fish & chip lunch on board. 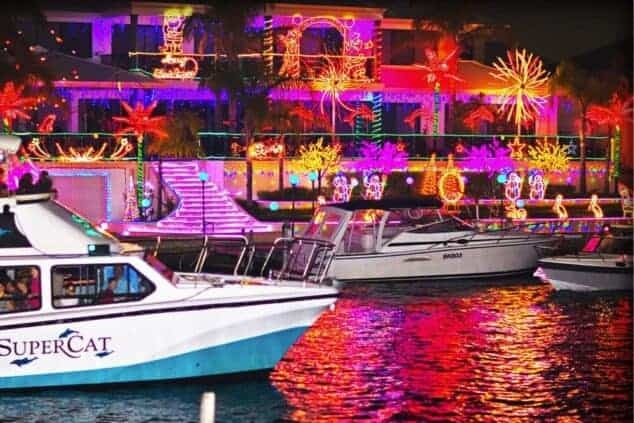 Show your Christmas Lights Cruise ticket to receive 25% OFF your booking. Terms & Conditions: To book online use promo code in your Christmas Lights Cruise booking confirmation. Discount doesn’t apply to food and drink options. Embark on a 3 hour Wild Seafood Experience catching Western Rock Lobster (Crayfish) before the crew cook and serve a delicious seafood buffet featuring the fresh catch and other fresh local seafood with unlimited beer, wine & soft drinks. Show your Christmas Lights Cruise ticket to receive $40 OFF per person. Terms & Conditions: To book online use promo code in your Christmas Lights Cruise booking confirmation. Discount doesn’t apply to additional food and drink options. Cruise out into the Peel Inlet on board our luxury crabbing vessel and pull nets with the guidance of our experienced crabbing crew, before scooping in the shallows of Boundary Island. Once back on board enjoy a delicious crab tasting! Show your Christmas Lights Cruise ticket to receive ‘Adults at Kids price’ of $59 (save $20).